Residential training programs provide participants with the opportunity to broaden and deepen their understanding of Ortho-Bionomy techniques and principles through an in-depth immersion of five or more days of uninterrupted study. Residentials allow time for learning and personal growth as well as relaxation to facilitate the integration of technique, philosophy, and the embodiment of "Be-ing" rather than "doing." Please consider joining us here in Asheville, NC for an unforgettable time. Our retreat this year will be set at a 54-acre mountain retreat center in Asheville, North Carolina. This beautiful location will allow us to learn, explore, seek wellness, experience mindfulness and integrate balance with our bodies, minds and spirits while surrounded by nature. All meals, tuition, and accommodations are included in order for you to sink deeply into the embodiment of Ortho-Bionomy. Asheville is that type of unique, special place that lingers sweetly in your mind and memories for years to come. The city's rich architectural legacy with its mix of Art Deco, Beaux Arts and Neoclassical styles is the perfect retro-urban backdrop to the edgy energy that emanates from the locally owned-shops and art galleries, distinctive restaurants and exciting entertainment venues. A bastion of cutting-edge art and technology in the Blue Ridge, the city also prides itself on its fascinating Appalachian past. While many cities underwent major overhauls in past decades, Asheville's historic and architecturally diverse downtown remains beautifully preserved. The world is just beginning to discover the uniqueness that is Asheville. 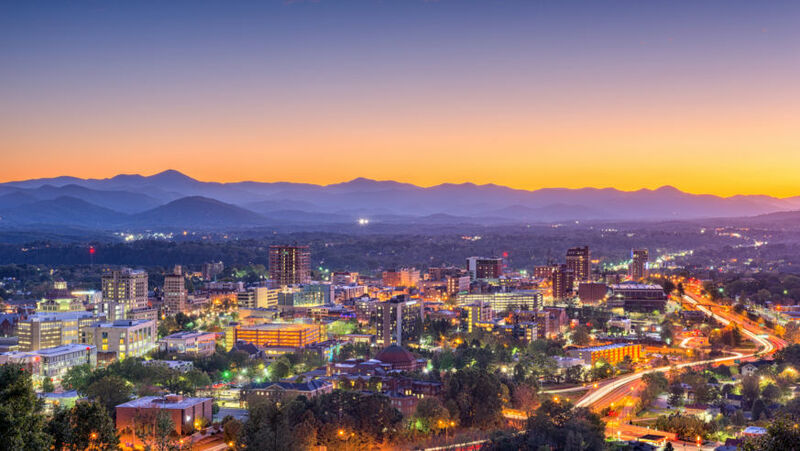 This thriving mountain city features a funky and eclectic downtown, 30-plus art galleries downtown alone, a burgeoning culinary scene, a thriving live music scene and, of course, the awe-inspiring scenery of the Appalachian Mountains. Yes! 3 meals a day are included in the retreat price. Wonderful vegetarian/ vegan fare is served at the OM Sanctuary and they can cater to people with the following sensitivities: Gluten (not Celiac- OMS is not a Gluten-Free facility), dairy free, soy free, and nut free (Please let us know). Meals are a combination of natural, organic, locally-sourced and vegetarian. Asheville is a growing city and getting here has never been easier. If you live regionally, the drive can be an enjoyable part of the journey. Fall is one of the most popular times to visit this area because of the beauty the changing leaves brings to the area. Air travel is becoming easier (and cheaper!) every day as our airport adds additional carriers. A car rental or an Uber/Lyft/cab ride can bring you to the doorstep of Om Sanctuary retreat center in less than 30 mins (~$30). We offer both shared (2 people, separate beds) and private cottages for this special retreat. Private rooms add a bit more individual space to rest and rejuvenate. There is limited space for private rooms, so reserve early! Studying Ortho-Bionomy with Jessica from Happy Body has changed the way I look at the world. Jessica has been involved in the movement, fitness, and wellness field for over twenty years. Her greatest love is working with and learning from the body. She is an Ortho-Bionomy® Instructor, Advanced Ortho-Bionomy® Practitioner and certified Pilates instructor. She currently owns and operates two locations of Happy Body, a fitness and wellness studio in Asheville, NC. Through the Ortho-Bionomy in Asheville program, she trains and mentors students through an embodied and wholistic approach. Jessica complements her primary practices of Ortho-Bionomy and Pilates with studies in Polarity Therapy, Gyrokinesis®, Trauma Therapy, and Body-Mind Centering®. Her experience as a professional dancer has strengthened the connection of touch and movement to create an accessible and engaging style of teaching. Jessica is a happy mama to Sydney and Jonathan, and a sensationally lucky partner to husband, Rich. Sheri brings a broad range of experience and hours of education into her teaching of Ortho-Bionomy. She has been a successful Instructor and Practitioner in both Crested Butte and Grand Junction Colorado. Her enthusiasm and amazement at the unique principles of this work add an element of practical and intelligent application that is important in each Practitioner’s experience. Her experience as an athlete and working with hundreds of athletes in her practice helps her understand the body on a complicated level which is reflected in her teaching by allowing the students to recognize patterns and movements that can cause injury. She is a talented instructor that relies on humor, insight and heart felt compassion. She is lively, passionate and brings nearly 20 years of practice to her teaching. Registration to hold your space requires a $250 nonrefundable deposit. A free Study group ($75 value). A free gift upon arrival to the residential. An opportunity to be upgraded to a Private room. If you have already booked a private room, receive a $200 credit instead. Choose and Click on one the options below or if you need other arrangements of have additional questions, please fill out our questions form. Thanks! We are looking forward to seeing you soon! You have been added to our mailing list and will now be among the first to have the opportunity to reserve spots in our upcoming classes, hear about other upcoming Ortho-Bionomy events and special offers! Find more information about Ortho-Bionomy and Ortho-Bionomy trainings at ashevillehappybody.com and ortho-bionomy.org. Ortho-Bionomy® is a registered trademark of the Society of Ortho-Bionomy International, Inc. and is used with permission.